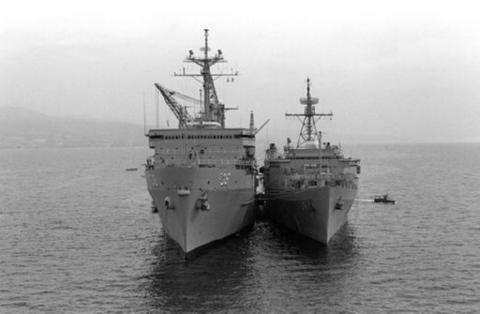 The USS PENSACOLA (LSD-38), an Anchorage-class dock landing ship, was commissioned on 27 MAR 1971. Like the other last four Anchorage LSDs, USS PENSACOLA was built at the General Dynamics Shipyard Din Quincy, Massachusetts. After fit out she steamed for Guantanamo Bay, Cuba for shake down training. Upon her return to her homeport of Little Creek, Virginia, USS PENSACOLA began a service career of deployments to the Caribbean, North Atlantic, Mediterranean. USS PENSACOLA served her country for 28 years, 6 months and 3 days, until decommissioned on 30 SEP 1999, always true to her motto, "For Freedom We Land". After decommissioning she was commissioned as ROCS Hsu-Hai (LSD-193) of the Republic of China Navy in June 2000. The fourth Pensacola was laid down 15 March 1969 by the General Dynamics Corp. Quincy Mass. ; launched 11 July 1970; sponsored by Mrs. Bernard M. Strean; and is scheduled to commission early in 1971. As the third of a new class of dock landing ships she is designed to replace earlier LSD's that cannot meet modern speed requirements.